For some unknown reason I’ve just received an invitation to a private view at a small art gallery that’s about ten minutes’ walk from my house. Cocktails included. I shall definitely go and will blog about it next week. I’m looking forward to it already. This invitation put me in an artistic frame of mind so, to follow up my post on randomness (and the corresponding parallel version on cosmic variance), I thought I’d develop some thoughts about the nature of perception and the perception of nature. 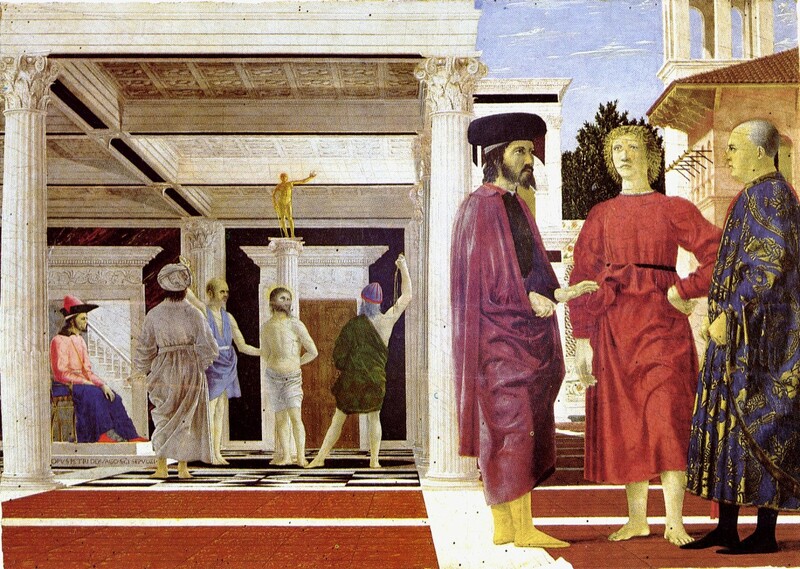 This famous painting is The Flagellation of Christ, by Piero della Francesca. I actually saw it many years ago on one of my many trips to Italy; it’s in an art gallery in Urbino. The first thing that strikes you when you see it is actually that the painting is surprisingly small (about 60cm by 80cm). However, that superficial reaction aside, the painting draws you into it in a way which few other works of art can. The composition is complicated and mathematically precise, but the use of linear perspective is sufficiently straightforward that your eye can quickly understand the geometry of the space depicted and locate the figures and actions within it. The Christ figure is clearly in the room to the left rear and the scene is then easily recognized as part of the story leading up to the crucifixion. That’s what your eye always seems to do first when presented with a figurative representation: sort out what’s going on and fill in any details it can from memory and other knowledge. But once you have made sense of the overall form, your brain immediately bombards you with questions. Who are the three characters in the right foreground? Why aren’t they paying attention to what’s going on indoors? Who is the figure with his back to us? Why is the principal subject so far in the background? Why does everyone look so detached? Why is the light coming from two different directions (from the left for the three men in the foreground but from the right for those in the interior)? Why is it all staged in such a peculiar way? And so on. These unresolved questions lead you to question whether this is the straightforward depiction first sight led you to think it was. It’s clearly much more than that. Deeply symbolic, even cryptic, it’s effect on the viewer is eery and disconcerting. It has a dream-like quality. The individual elements of the painting add up to something, but the full meaning remains elusive. You feel there must be something you’re missing, but can’t find it. This is such an enigmatic picture that it has sparked some extremely controversial interpretations, some of which are described in an article in the scientific journal Nature. I’m not going to pretend to know enough to comment on the theories, escept to say that some of them at least must be wrong. They are, however, natural consequences of our brain’s need to impose order on what it sees. The greatest artists know this, of course. Although it sometimes seems like they might be playing tricks on us just for fun, part of what makes art great is the way it gets inside the process of perception. Here’s another example from quite a different artist. This one is called Lavender Mist. 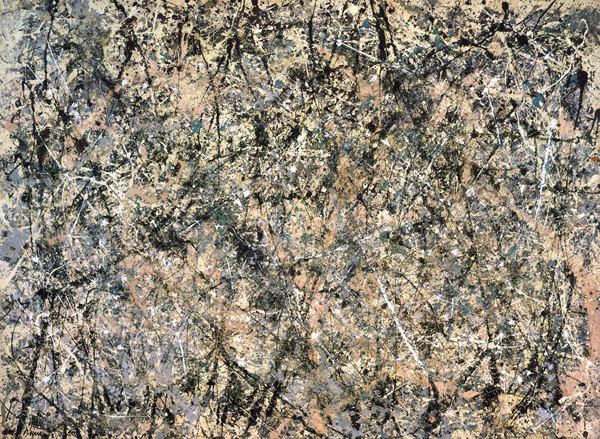 It’s one of the “action paintings” made by the influential American artist Jackson Pollock. This, and many of the other paintings of its type, also get inside your head in quite a disconcerting way but it’s quite a different effect to that achieved by Piero della Francesca. This is an abstract painting, but that doesn’t stop your eyes seeking within it some sort of point of reference to make geometrical sense of it. There’s no perspective to draw you into it so you look for clues to the depth in the layers of paint. Standing in front of one of these very large works – I find they don’t work at all in reduced form like on the screen in front of you now – you find your eyes constantly shifting around, following lines here and there, trying to find recognizable shapes and to understand what is there in terms of other things you have experienced either in the painting itself or elsewhere. Any order you can find, however, soon becomes lost. Small-scale patterns dissolve away into sea of apparent confusion. Your brain tries harder, but is doomed. One of the biggest problems is that your eyes keep focussing and unfocussing to look for depth and structure. It’s almost impossible to stop yourself doing it. You end up dizzy. I don’t know how Pollock came to understand exactly how to make his compositions maximally disorienting, but he seems to have done so. Perhaps he had a deep instinctive understanding of how the eye copes with the interaction of structures on different physical scales. I find you can see this to some extent even in the small version of the picture on this page. Deliberately blurring your vision makes different elements stand out and then retreat, particularly the large darkish streak that lies to the left of centre at a slight angle to the vertical. This artist has also been the subject of interest by mathematicians and physicists because his work seems to display some of the characteristic properties of fractal sets. I remember going to a very interesting talk a few years ago by Richard Taylor of the University of Oregon who claimed that fractal dimensions could be used to authenticate (or otherwise) genuine works by Pollock as he seemed to have his own unique signature. I suppose what I’m trying to suggest is that there’s a deeper connection than you might think between the appreciation of art and the quest for scientific understanding. This entry was posted on April 15, 2009 at 2:17 pm and is filed under Art, The Universe and Stuff with tags Jackson Pollock, Lavender Mist, Physics, Piero della Francesca, Science, The Flagellation of Christ. You can follow any responses to this entry through the RSS 2.0 feed. You can leave a response, or trackback from your own site. We might not agree on this subject… Jackson Pollock is/was a complete charlatan. I’ll gladly defend my view if others differ. I was sure someone would have a go at Pollock, although it took less time than I thought! Of course you’re entitled to your opinion about Pollock. I don’t really know much about him and can only say that I think I find the action paintings absolutely fascinating. He was usually completely pissed when he did them but, for whatever reason, they are extremely difficult to imitate. I think the fact that people still argue about his work 50 years after his death (he died in 1956) must mean something. There was an article in the Guardian a while ago posing the question “Pollock: Genius or Charlatan?”. Maybe he was both. He might also have been a bit mad as well. The real issue about art (especially paintings) is the way they acquire their financial value. What is is about Van Gogh, for example, that makes his work so valuable? Not just the work itself, that’s for sure. Anyway, my post wasn’t about the instrinsic worth of these works of art, but simply a response to their psychological effect. In that respect what matters is what’s there on the canvas not how it got there or for what reason. I’d also say that paintings one of the other famous abstract expressionists, Mark Rothko, also play with the mind in interesting ways. I found the paintings in the Rothko room at the Tate, for example, to be very sensual, giving me an almost unbearable urge to touch them although I never really understood why. Sure, there have been charlatans in every generation of artists, but an equally important issue is why they came to represent the mainstream in the 20th century. That is a wider question, because it is about society, not just artists. Personally I think that our culture has gone insane. There are quite a few indications that it might not have long to live.